When looking at Antonia Hirsch’s exhibition at the SFU Gallery, John Carpenter’s 1987 film, Prince of Darkness, came to mind. Satan is portrayed as infectious green ooze imprisoned in a jar and kept hidden from the world by a secret Catholic brotherhood, so that he may not call forth his progenitor. This “father of Satan” or “Anti-God” resides in the realm of antimatter and is summoned through a mirror acting as a portal. The film’s characters believe that this anti-being will bring about the end of the world through its negation of our universe. 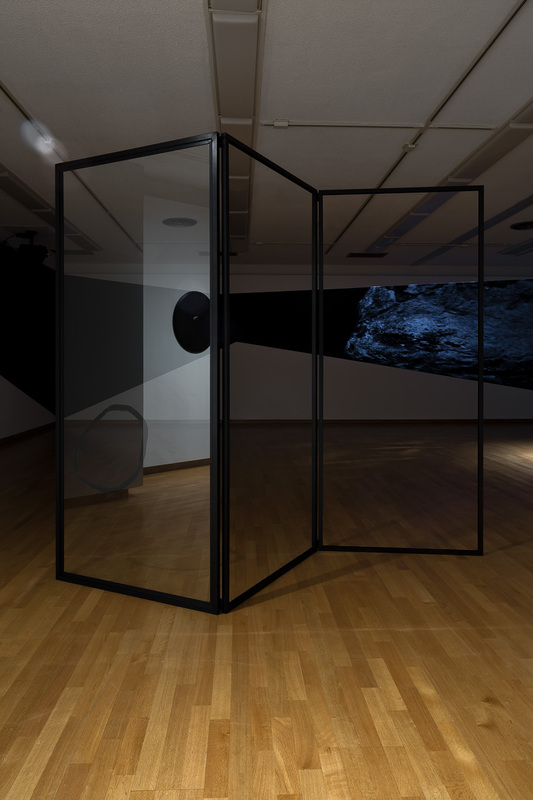 Hirsch’s exhibit brought to mind this realm of antimatter, represented as a space of negation accessed through mirrors. Under sombre lighting, the first reflection encountered in the exhibition is the viewer’s own. Framed in a three-part, room-dividing screen, an oblong glass makes the viewer aware of themself in the space, similar to the feeling of seeing oneself reflected in a street window while walking, but also allowing the viewer to see beyond the reflection. The second instance is that of a black and white still image in a circular frame, reflected on a similar monochrome moving image on the far wall. The former image taken by NASA is of an asteroid, specifically 433 Eros, whereas the latter is a stop-motion-like succession of images taken of a withered potato in rotation. An outline of a shape (is it of an asteroid? a potato?) painted on the standing screen glass ostensibly connects these images. Projected onto an anamorphic black shape painted on the far wall of the gallery, the potato resembles an asteroid, just as 433 Eros is potato-like in its shape. The asteroid refers to a space beyond that of our phenomenological experience, while the potato is terrestrial, literally from the earth. The convex frame around the asteroid alludes to portraiture framing, but it also refers to the sign-shaped sculpture positioned next to the tuber video. Claude glass is a black mirror that was used by landscape painters before the widespread use of photography. Normally convex-shaped, it was carried in a pocket or in a satchel and positioned in such a way that the painter would have his back to the scene he was painting. Dozens of black mirrors, in the shape of smartphones, tablets, and other mobile devices, cover this sculpture that resembles a standing sign. This work can be read as a comment on the prevalent and pernicious use of mobile devices in the contemporary moment, as most of us are constantly looking at the world reflected in our personal black mirrors. Through social media, we project our narcissistic selves into the internet; a negative space that connects and distances in equal measure. If we are gazing into this void, who, or what, is looking back at us? Nietzsche states that “if you gaze long enough into an abyss, the abyss will gaze back into you.” What happens if we gaze into the abyss and only see ourselves? Antonia Hirsch’s Negative Space is at SFU Gallery until December 13. Visit sfu.ca/galleries for more information.